I love a good list. There is something about ticking things off a list at the end of the day that brings me an irrational level of satisfaction. Sometimes I’ll even add things to my list that I completed but hadn’t initially planned to just so I can tick them off! Is that weird? Maybe. But I’m sure I’m not alone. Along with a good list, I can’t go past a good daily planner. 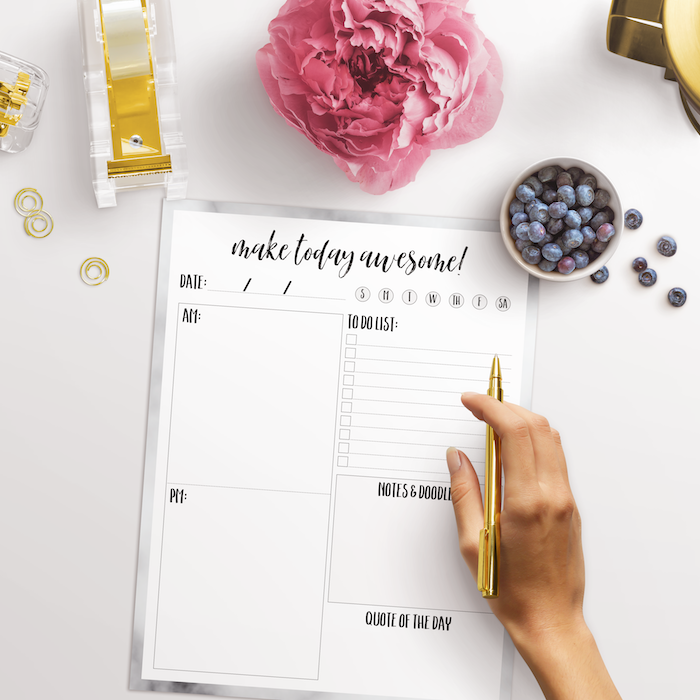 So what could be better than a simple printable daily planner? How about a FREE printable daily planner! I love being able to print out my daily planner and add everything I need to get through on there. I can tick things off, add things in and generally feel productive. 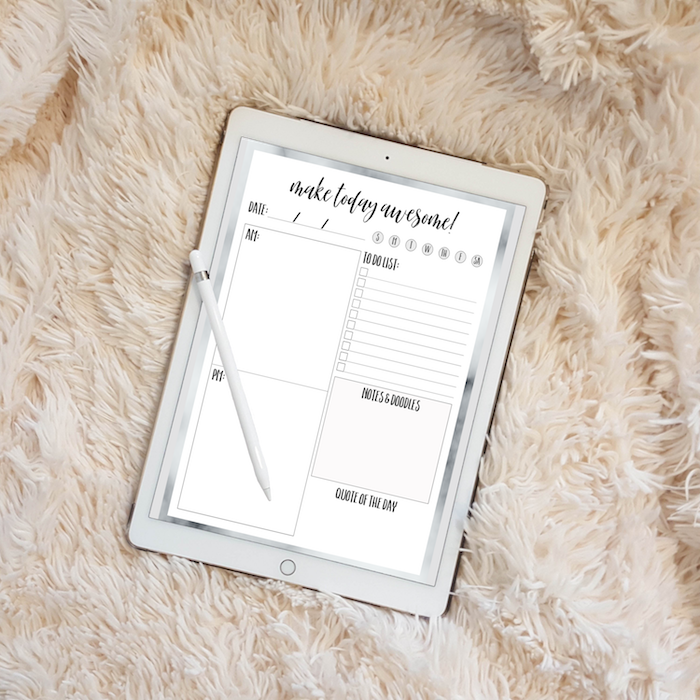 Whether you want to use it for work or around the house, this simple minimalist printable daily planner has you covered. And even better, it’s free to download and print all you like. The only thing I ask is that if you want to share it, you share a link to this page. Lately I’ve really been feeling I need more hours in the day. I just can’t seem to get on top of things and it’s driving me a bit crazy. I went searching for productivity tips and ideas on how to get more done in a day and I’ve been testing a few suggestions out. Here are my top simple tips for getting more done in a day. 1. Put sneakers on at the beginning of the day. I don’t know where I originally read this but it really does work. There is something about wearing runners that puts a spring in your step and helps increase your productivity. I’m less likely to sit down if I’ve got sneakers on so it also keeps me more active. Try and group all similar tasks together. Bulk cut up food and cook in one go so that you only have to clean and wash up once. Do all computer related activities in one session. Pay all bills at once. Find tasks with a common theme and try and do them in one session. If you commute to work (or even just around town doing errands). Use the commute to make phone calls (with a hands free of course). It’s more productive to wait on hold with Telstra for 45min in the car than at home. Try not to get sidetracked by doing things you hadn’t planned and that are off task. Stick to what you set out to do. Lists help keep you on track and make sure you don’t forget anything. Try writing a list the night before and you’ll probably find your are more productive. A daily planner like the one below can also help. Getting your free printable daily planner is super easy. Just click on the link below and you’ll be taken to the PDF file which you can save. Remember, if you would like to share it, please send people back to this page. p.s. This planner is FREE, don’t try and sell it to others on your website or pass it off as your own. That’s not cool.